diy investor is 5 years old! Well, when I started this blog back in 2013, I never imagined it would be still trundling along 5 years later. I suspect this may be partly due to having quite a bit of spare time since taking early retirement and partly due to the fact that I am probably too lazy to 'get a life'. It is a record of the later years of my personal investing journey and, looking back, it is clear the focus has changed quite a bit since February 2013. Back then, I held most of my equities in a mix of investment trusts and individual shares. Over the past couple of years the shares have been reduced and now are all gone as well as some of the trusts. 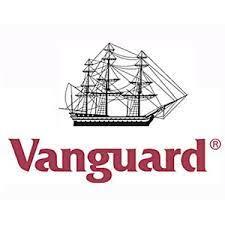 I have increasingly embraced the lower cost index alternatives such as Vanguard LifeStrategy. First of all a big thanks to everyone who visits on a regular basis. Page views seem to have increased quite a bit since the early days. Total page views to date - 801,450, average per month is now around the 16,000 mark. A total of 394 posts (200 in 2013/14) and most viewed article - Asset Allocation Revisited with 35,500 so far, followed by Vanguard Lifestrategy - A One-Stop Solution. In 2016 I was fortunate to be invited to write a guest post for Monevator following the publication of my latest book 'DIY Simple Investing' and a link in the article has boosted the views. 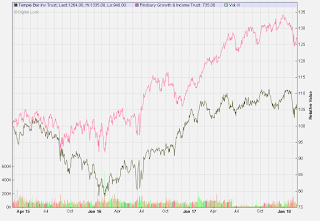 Other popular articles are Work Out Your Retirement Figure and Vanguard Lifestrategy - 5 Year Performance. The main sources of referring sites have been Monevator, Retirement Investing Today, Simple Living in Suffolk (now in Somerset!) and Money Saving Expert - many thanks! Obviously, the majority of people visiting the blog are from UK (70%), however I am continually surprised to see how far diy investor has reached globally - USA (20%), and the remaining 10% between Germany , France, Russia, Ukraine, Spain, Netherlands, Belgium, Ireland, Italy, Japan, Australia, India, China, Indonesia, Singapore, Serbia and New Zealand. As I say in my book “DIY Simple Investing”, family and friends soon change the subject when personal finance is discussed so, on a personal level, its really good to have an outlet for my ‘hobby’ of personal finance and investing and to be able to share it with what seems like an ever expanding community of like-minded people. It is, of course, always interesting to look back at earlier posts and sometimes I am surprised at just how far my thinking has changed and developed since starting the blog. In the early days, I was firmly committed to a strategy of generating a natural income from a mixture of individual shares, investment trusts and fixed interest securities. Over the past few years, I have read many interesting articles on various blogs and, as the time has passed, I have begun to embrace the low cost index philosophy. I have reviewed my former strategy and believe my process has become stronger and more balanced - as well as simpler! 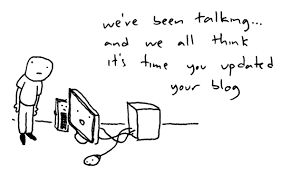 After 5 years I find I am still enjoying my blogging and so long as I remain positive and others keep visiting, I hope to keep things going for a while longer - although if my portfolio is reduced to a couple of Vanguard trackers, there may not be too much to write about! Thanks again for sharing the journey and for the comments…Here's to the next 5 years, assuming we all get through Brexit! I hold this investment trust in my ISA. It is part of my ‘basket’ of income-focussed investment trusts designed to provide an above inflation rising natural income and hopefully some increases in capital over the longer term. This contrarian approach centres on long-term investment in cheap, out-of-favour companies in the belief that over time, these will be affected by reversion to mean. 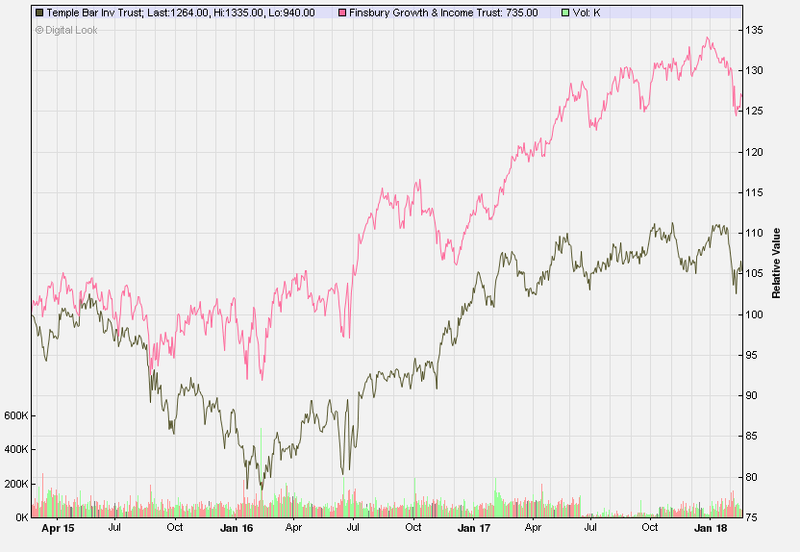 This approach has proved very successful over the longer term with the trust outperforming the FTSE All Share index over the past 5 & 10 years. In 2016 it was one of my best performing trusts with a total return on net assets of 20.4%. They have today published full year results for the 12 months to end 2017 (link via Investegate). Unfortunately, they were unable to outperform the FTSE this year with total return of net assets increasing by 9.7% compared to a gain of 13.1% for the FTSE All Share index. The contrarian approach often requires long periods before the benefits for the trust are realised. Temple Bar has ongoing charges of just 0.6%, a natural dividend yield of 3.3% and provided the third-best 10-year total returns in the UK equity income sector (top place held by Finsbury Growth & Income) despite a poor run in 2014 and 2015. The trust is committed to paying a rising dividend year on year and has met this commitment for the last 34 years. The board are recommending a final dividend of 17.48p making 42.47p for the full year - an increase of 5% on 2016. The dividend is covered by income receipts of 43.3p. This trust is a relatively small proportion of my total portfolio currently ~3% or so and I am happy to retain on the basis that it provides a reasonable income and has a good track record of providing some decent appreciation to capital over the longer periods. In 2015 I opened an additional ISA with Halifax to hold my Vanguard Lifestrategy 60 fund and for a one-off buy and hold this is still cheaper than Vanguard so I will keep it going. I also have my AJ Bell Youinvest ISA in which I hold my mix of investment trusts which I will also retain. However, last May, Vanguard Direct launched their own platform with annual charges of just 0.15% per annum and I made a mental note to look at a new ISA for this coming year with Vanguard when the time came around to add to my Lifestrategy holding. I have been accumulating cash from various sales over the past year and I have held off adding to my global funds mainly due to the weakness in sterling following the EU referendum outcome. However, in recent weeks the pound has strengthened considerably against the US Dollar and recently clawed its way back above the $1.40 level for the first time since June 2016. In addition, there has been a sharp correction in global markets which has been the trigger to dip a toe in the water. In the past week I spent a few minutes online to open my new S&S ISA with Vanguard Direct and I will now start to build my holding in the VLS 40 but will take things slow and steady and drip feed small sums back in as the markets are still close to their all-time high point. As Vanguard do not make a charge for the sale and purchase of funds, it seems to be a slightly better option than Halifax with its £12.50 dealing fee. The only charges for my new ISA are the annual platform fees of 0.15% - which works out at £1.50 per year for each £1,000 invested or £30 p.a. for the full ISA allowance of £20,000. Of course, I am limited to Vanguard funds however for me this is not really a problem as I can hold a wider selection of investments with my other two providers. My initial purchase is the VLS 40 (inc) @ £146 and I hope to make several additions over the coming year or so.